Direct deposit is a fast and easy way to receive your payroll or other deposits directly into your chequing account. Pre-authorized payment is a convenient way to automatically pay your bills from your chequing account. This form provides account information in place of a voided cheque and is used when arranging for direct deposits and pre-authorized payments. 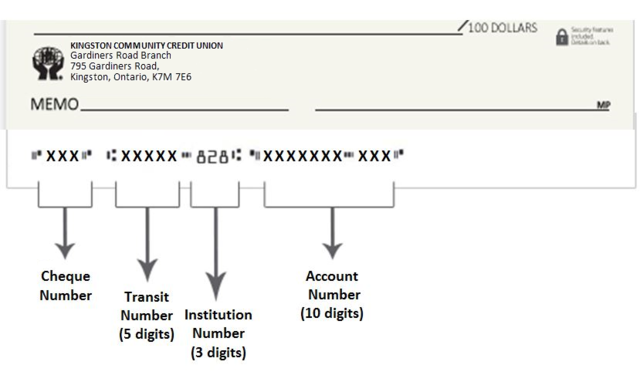 How to find your banking information on a personal cheque. You'll find your account number details on the front of your cheque. The first five digits are the transit number and the last 10 digits are the account number. It is very important to use all 10 digits, including the leading zeros. Please refer to the front of your cheque for your account details. By submitting this form by way of e-mail, fax or mail I authorize the Credit Union to obtain such factual and investigative information regarding me from others as permitted by law and to furbish other credit grantors and any credit bureau, particulars of this credit application. In addition, I hereby acknowledge notice from the Credit Union that a consumer report containing credit information may or will be referred to in connection with this application for credit or any renewal or extensions thereof. I/We agree to the above terms. If you do not agree with the terms outlined above, please click on the button, following.